No business can afford to overlook the potential of social media when it comes to recruitment. Almost half (48%) of candidates have used social media when searching for their most recent job, and 59% use social media to investigate companies that have captured their attention. However, as with traditional recruitment, you need to plan your strategy before trying to attract candidates online. Who are you trying to reach, and how will you reach them? LinkedIn, Facebook, Instagram, and Twitter are currently the most popular social media platforms for recruiters. Building your reputation across all major platforms will maximize outreach. However, some platforms offer additional benefits. For instance, LinkedIn allows you to hone in on well-qualified, experienced candidates. Instagram emphasizes photos and videos, so is a good choice for creative industries. 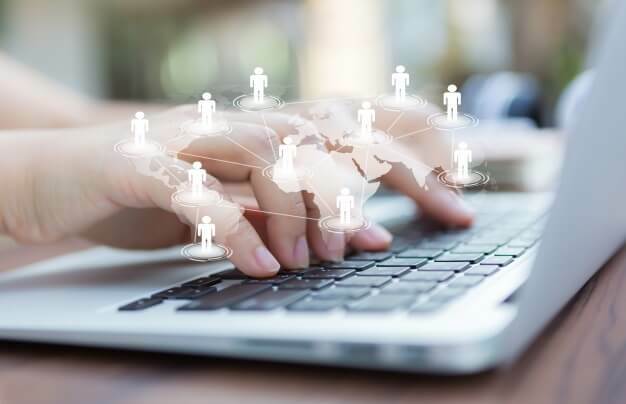 Joining and posting to Facebook Groups can be an effective way to connect with candidates interested in your niche. Aside from the obvious social media platforms, find the forums and networks in your niche. For instance, if you need to hire developers, look on GitHub for candidates with strong portfolios. Candidates do not want to work for a company just for a salary, increasingly, they want to get a sense of an employer’s story and values before making an application. Businesses that publish biographies with a human touch are more attractive. Make sure that your company profiles are up-to-date and communicate your vision. Don’t be afraid to show some personality on social media. Photos and videos that give an insight into the day-to-day activities of your business will engage candidates. For example, you could publish videos featuring short interviews with existing employees. Use images and vocabulary that resonates with your target demographic. For instance, if you are looking to recruit recent graduates, a youthful, energetic aesthetic would appropriate. If you are trying to attract well-established professionals, a more conservative approach may be preferable. Social media isn’t a one-way street. Interact with your followers. For instance, if they ask a question, respond in a timely manner. Even if they make a negative comment, you can use the situation to your advantage. Give an honest, humble answer and thank them for their input. Are you sure that your content is exceptional? The vast majority (90%) of companies use some form of social media as part of their recruitment strategy. Standing out from your peers can present a challenge. Mediocre, generic content is no longer enough to capture candidates’ attention. Whether you publish images, videos, or text, you need to check that they strike the right balance between “approachable” and “professional.” For instance, your company videos do not need to be of Hollywood standard, but they should be of reasonable quality. Your logos should be crisp and professional, and your images should be clear and edited if necessary. When it comes to written content, don’t be afraid to outsource the job if you don’t have a talented writer on your team. Well-written blog posts can be an excellent investment if they keep drawing high-quality candidates to your site or profile. Give your audience useful content, and they will keep engaging with you. Along with you could offer quick video tutorials or links to full-length articles relevant to candidates in your niche. Before you publish a piece of content, ask yourself whether it is entertaining or useful. Ideally, it should be both. Get feedback on your content from existing employees. Ask them whether they researched your company online prior to joining and whether they think your online presence will attract the right kind of candidates. Are you sending your audience a clear CTA? Using content to build brand awareness is just the first step. If you are using social media as a recruitment tool, you need to signpost interested parties to an application page or portal that gives further information on current job openings. Give potential candidates the chance to sign up to your mailing list. They may not be interested in your current job openings, but they may decide to apply to your company in the future if you send them details of new vacancies via email. Do you know how to evaluate your social media strategy? Don’t waste your time on strategies that don’t attract interest from suitable candidates. Once you have clarified your CTA, you can assess whether you are getting the results you need. For instance, are your social media posts proving effective in directing candidates to your website? Are you receiving an increased number of applications and, if so, are they coming from people who appear to be a good fit for your company? Decide on meaningful metrics in advance so you can adjust your approach if necessary. If you are using paid advertising, you need to consider whether your ad campaigns are saving you money. Keep track of your ROI. Ideally, social media should cost you significantly less money per candidate compared to traditional channels. Simply counting the number of likes or shares you get doesn’t give you the full story; you need to dig deeper and ascertain whether the right people are engaging with your content. Do you know how to evaluate potential candidates’ social media profiles? You can – and arguably should – use social media to evaluate a candidate’s suitability. However, you must be careful when gathering background information, even if they post a lot of personal information for the world to see. The safest approach is to avoid researching a candidate on social media until you have met them in person. Recruitment experts Monster recommend that you conduct social media searches in a standardized way, using them at the same stage of recruitment for each candidate. They also advise that you capture evidence that puts the candidate’s suitability in question, such as screenshots of inappropriate posts or photos. This protects you from charges of discrimination on grounds of gender, age, or another protected characteristic. As a general rule of thumb, treat information gleaned from social media as though the client has disclosed it during an interview. If in doubt, consult a legal professional prior to making your final decision based on a candidate’s posts. Remember that people are multi-faceted, and one error of judgment does not necessarily mean they should be dismissed as a candidate. Finally, you need to bear in mind that social media management is a long-term project. Devising, planning, and producing suitable content and interacting with other users can soon become a full-time job. You can either set aside a few hours per week to maintain your social media presence, employ a part-time or full-time social media manager, or outsource the task to a specialist company. Whatever your preferred approach, be prepared to review and revise your strategy from time to time. When done properly, recruitment via social media can transform your company and attract the very best talent. Pauline Farris speaks Portuguese, English, Spanish and Italian and currently she works as an interpreter for TheWordPoint. She travelled the world to immerse herself in the new cultures and learn languages. Today she is proud to be a voting member of the American Translators Association and an active participant of the Leadership Council of its Portuguese Language Division.